Last year Merton Council sent me a booklet featuring local businesses that were offering work placements for young people. It was part of a scheme set up by our MP, Siobhain McDonagh to tackle youth unemployment. Unfortunately I was visiting family when the placements were starting, so couldn't take part, but was still invited to the Parliamentary Graduation Ceremony, which was to take place in the House of Commons. The reception was held in the Atlee Suite in Portcullis House, the newest addition to the Parliamentary estate. It is also the most expensive, having cost one million pounds per office. Since five of the seven floors are offices, that's a lot of money. Part of the reason for this is because it was built at the same time as the Westminster Jubilee Line Station, which runs directly beneath. The building was official opened by Her Majesty The Queen in February 2001. Despite the name, Portcullis House is not a fortress with heavy iron grated doors, but an energy saving structure with a glass covered courtyard, steel arches, and copper chimneys. The ground floor arcade is a light open space with cafes, rented trees, and seating for MPs to hold meetings in a relaxing environment. The first floor is where all the guest receptions are held, including the one I was going to in the Atlee Suite. Security is obviously tight, and part of the way they control the number of people who can enter at one time is by using those old fashioned round-a-bout doors, which I think adds a nice architectural touch. Once inside you have to go through a complete security check, so to save hassle, if visiting, it is probably best to leave any jewellery or gadgets at home. Upstairs, many portraits were hanging on the walls, Including ones of David Cameron, Tony Blair, Ian Paisley, and Paul Boateng, who is seen wearing a peculiar blend of outfits because neither he nor the artist could decide what to paint him in. The Parliamentary Works of Art Collection consist of nearly eight thousand commissioned pieces that are loaned out to public exhibitions. The Atlee Suit is named after Rt Hon Clement Atlee (1883-1967); he was Prime Minister between 1945-1951, and made 1st Earl in 1995. There is a chalk sketch of him in the room, by Juliet Pannett, which was loaned to the House of Commons in 2003. At first the Atlee Suite doesn't look anything special, but look up, and you'll see an interesting wave design ceiling, with curved lights hanging down. For the first half hour, guests chatted over nibbles and drinks. This was partly because people wanted to be sociable, get to know one another, and make connections. But there was another reason; in an attempted to keep everyone chatting, Siobhain would not let anyone sit down. Even when it was time for the ceremony some people had to stand. Siobhain said, 'I apologise for there not being enough seats; the reason for that is I lie. I never tell them quite how many people are coming to my events. That would make a great headline, wouldn't it? "Politician Lies."' Hey, we're all used to it by now. After thanking everyone for coming, one of her staff (I can't remember his name, but we'll call him Rory), announced the work experience participants, and then all got up and had their 'wedding photos' taken with the mayor. This was followed by an inspiring talk given by a seventeen year old girl, who set up a project called One Way, after her cousin was killed by a gang. She invites other young people to her house for barbecues and to chat about their own experiences in an effort to prevent gang related crime. The best part of the evening was the Parliamentary tour, in which we got to see several areas not usually open to the public. Although I was invited as a guest, anyone can get a full tour of The Houses of Parliament. You can book a tour, through your MP, during the Summer Opening Programme in August and September, or book a Saturday tour. There are various types of tours available, including and audio tour, guided tour, afternoon tea tour, Elizabeth Tower tour, tactile tour for the blind & partially sighted, portraiture tour, and a House of Lords tour. The tour Rory took us on was only partial, but we still learnt lots of interesting things. We were taken from the Atlee Suite down to an underground chamber, which had a statue of the Lion and the Unicorn on each side. At first I thought we were underground, but moments later we were outside in the courtyard facing the magnificent Elizabeth Tower. London's iconic clock tower is not nearly as old as I thought; neither are a lot of the Parliamentary buildings. This is because in the nineteenth century, Part of Parliament court fire. When the pubic heard about this, they all ran from their homes to Westminster, and instead of trying to help put the fire out, they all cheered and watched it burn to the ground. 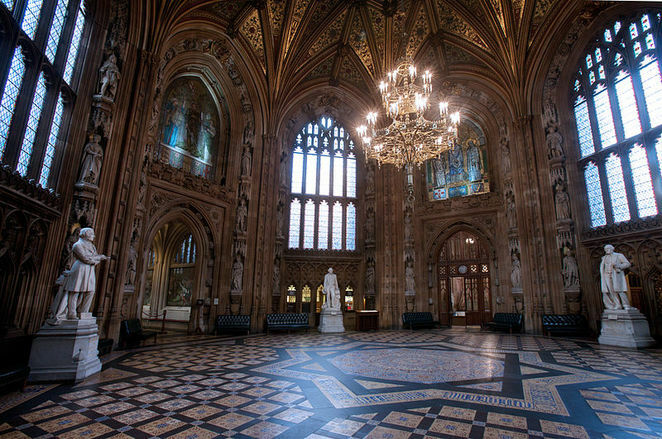 Westminster Hall is both the oldest and biggest part of Parliament, dating back to the eleventh century. The last King to reside there was Henry VIII before moving to Hampton Court. Henry was a big fan of tennis, and is believed that he used to actually play tennis inside the hall. Brings a new meaning to the term tennis court, doesn't it? We know this because during the Second World War, Westminster Hall was bombed. Although no one got hurt, and the building was still standing, they had to check the roof to make sure it was structurally sound. While they were up there, they found a sixteenth century tennis ball in the rafters. On the slate floor there are several plaques to those who received stately funerals. Amongst these are Winston Churchill, George V, and George VI, and the Queen Mother. When George VI died in 1952, he was given a large plaque centred on the slate. At the time no one thought the Queen Mother would get a stately funeral, but she lived for almost another fifty years, by which point the public had come adorn her. The raised groove in the slate is where George's original plaque was removed, so they could make room to put the Queen Mother's plaque beside his. As there was a child on the tour with us, Rory explained things Horrible History style. He told the gruesome story of Charles I, who was beheaded after being found guilty of children, and how Oliver Cromwell and his son cancelled Christmas. The commoners did not like this, and vied to have a king back. Charles II took the thrown, but because he blamed Cromwell of his father's death, he dug up the man's body, put it on trail, found him guilty of treason, and chopped off his dead head. Cromwell's head was then gouged with a spike and put on display outside Westminster Hall as a warning never to depose a king again. Rory then took us to St. Stephen's Hall, which was designed to look like St. Stephen's Chapel. 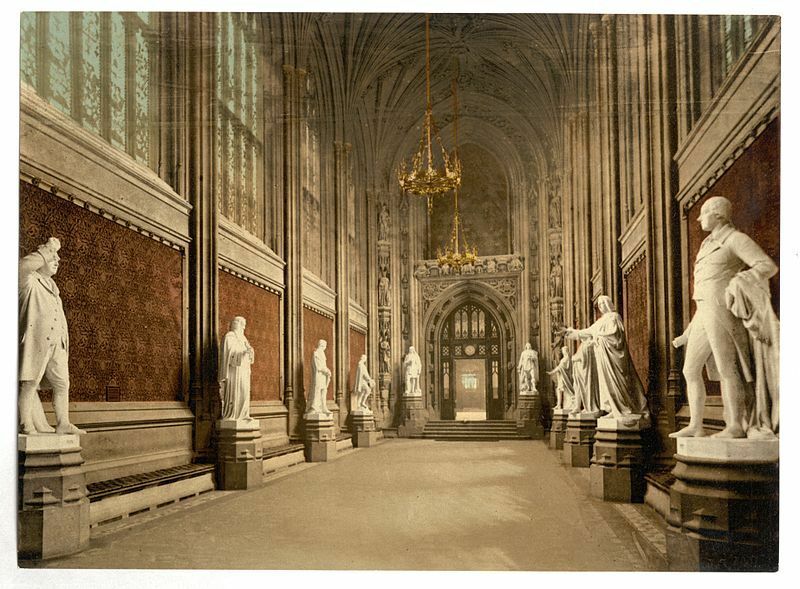 The hall is lined with statues at either side, with the one at end being a small reminder of what women had to go through for the right to vote. During the Suffragette Movement, several women chained themselves to the sword of Viscount Falkland's statue. During the authorities struggle to unchain them, the sword snapped in half. There is now a noticeable line where the two pieces were stuck back together. The only other tribute to the Suffragettes is in an off limits broom cupboard in a basement that nobody uses. It is a plaque commemorating Emily Davis, who is known for being killed after throwing herself in front of a horse carriage in protest. Emily was furious about women not having the right to vote, and found it ridiculous that women were not allowed to be MPs. To prove how ridiculous it was, she thought it would be ironic if a woman's registered address was Parliament. So on the night of the census, she snuck into Parliament and locked herself in the broom cupboard. When Emily was discovered next morning, the census had to register her address as the House of Commons. St. Stephen's Hall leads to Central Lobby, which happens to be the death place of Britain's only assassinated Prime Minister, Spencer Percival in 1812. Apparently, no matter who you are, if you die in Parliament, you're entitled to a state funeral. Government have devised a loophole around that, however. If a member of the public we to die there, maybe from a sudden heart attack during a tour, they would actually wait until the person was taking him to the hospital before officially announcing them as dead. Central Lobby has four archways leading to a different area. Above each archway is an ornate mural depicting the patron saint from each country in the United Kingdom. It is meant to signify unity, but where the murals are placed reads into things little deeper. For example, St. George of England leads to The House of Lords – the civilised, upper class society with all the power. St. David of Wales on the other hand leads to The House of Commons. St. Stephen of Scotland takes you to several bars, and St. Patrick of Northern Ireland is being shown the exit. Have you ever wondered why The House of Lords is red and The House of Commons is green? It was an indication of status. At the time red was the most expensive dye you could use, whereas green was the cheapest. Did you know that The Queen is not allowed to set foot inside The House of Commons? It all dates back to Charles I. Five MPs had written a slanderous booklet about him, and when Charles found out, he made his way to Parliament to arrest them. The MPs got wind of this, however, so barred all the entrances, and managed to make their escape before the King got inside. Charles was furious, and demanded an explanation. But he was told that while he may be king of the country, inside Parliament, MPs take their orders from government. Since that day, no monarch has been allowed inside The House of Commons. If The Queen wants to relay a message, she has to send her Black Rod. He has to bang on the door before being let in. Evidence of this is clear from the chips on the door, which have been made from years of constant banging. While The House of Lords was closed at the time, our tour group were allowed into The House of Commons. 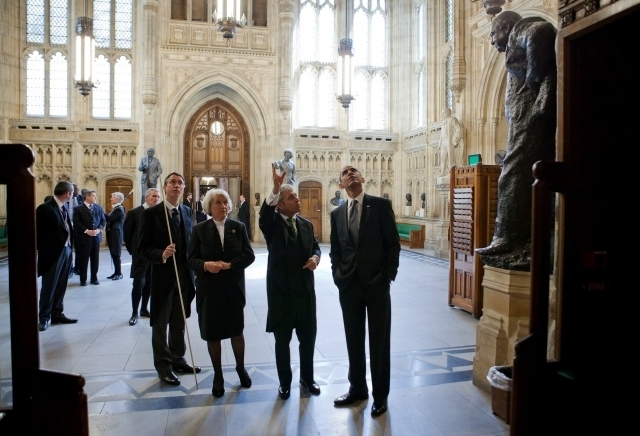 In the Members' Lobby there are four statues, each representing our most significant Prime Ministers of the twentieth century. These include Winston Churchill, Margaret Thatcher, David Lloyd George, and Clement Atlee. Politicians used to touch Churchill's for good luck before going into the Commons, but it started to get messed up, so now there is a sign saying not to touch. When The House of Commons was bombed in the Second World War, Churchill had everything repaired, except the one arch leading into the Commons Chamber. This was to act as a reminder to how close we came to losing the war. 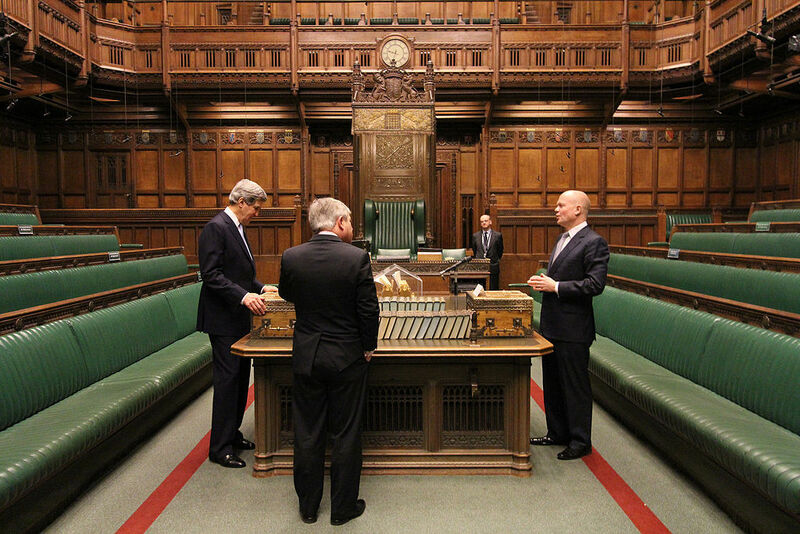 The Commons Chamber is actually a lot smaller than it looks on TV. Churchill purposely rebuilt it so that there were not enough chairs, so on a full day, many people have to stand, making it look more crowded and imposing. It is from the House of Commons that we get the sayings 'crossing/toeing the line'. In front of the benches are two parallel lines that are two sword's lengths apart. This was so opposing parties could not threaten one another. If they crossed it, they were being naughty and told to 'toe the line'. Before the tour ended, Rory gave us one last bit of possible 'too much information'. No one is allowed to speak unless someone is sitting in the head chair. If the head needs to take a break, someone is there to keep the seat warm for him. In the past, however, there was no substitute, so if the head needed to relieve himself, he pulled down a curtain in front the chair so debate could continue without interruption. Yep, that definitely fits into the category of Horrible Histories.